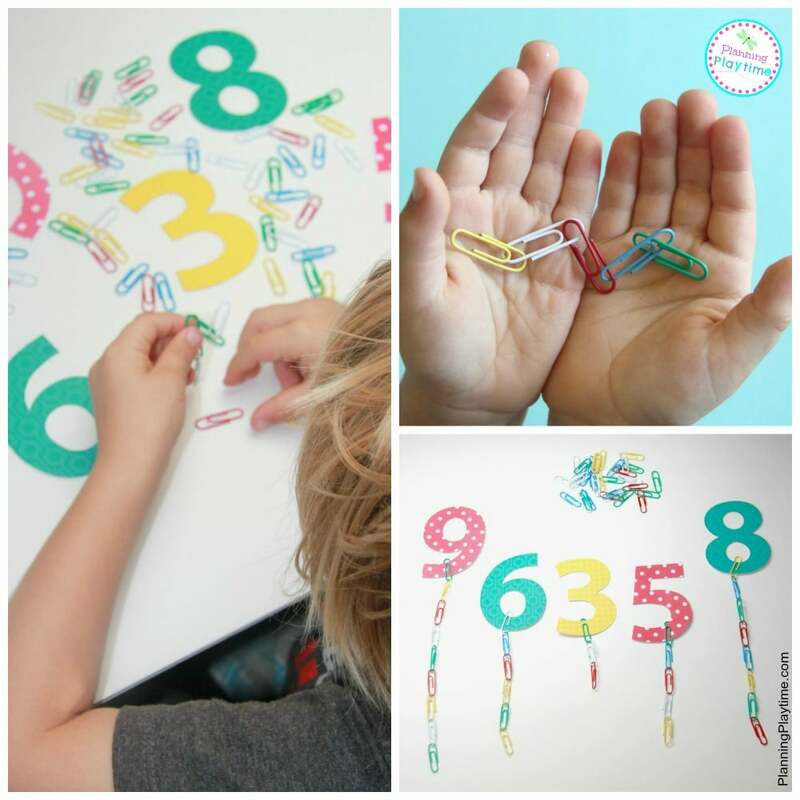 I can’t wait to share our latest preschool counting activity with you, Paperclip Chain Counting. 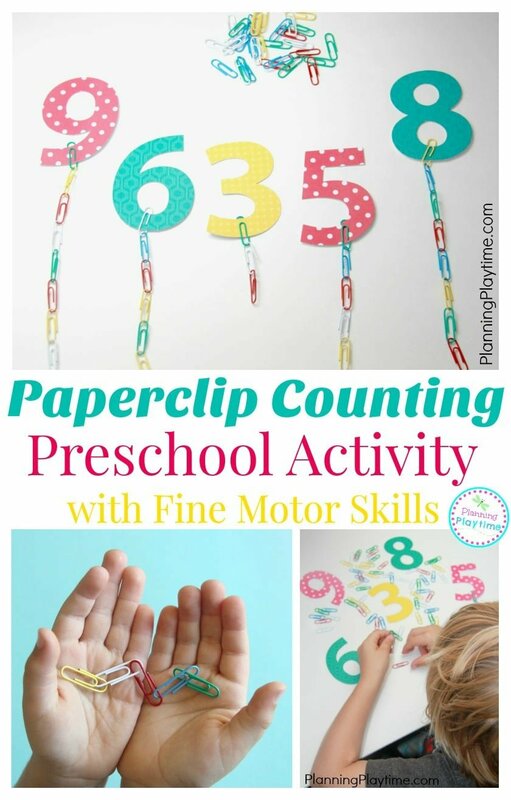 Basically, if counting and fine motor activities had a baby, this would be it. It is a perfect combo of hands on counting fun. What makes it even better? If you can find multi-colored paperclips at your local office or dollar store. Ours are even rubber coated to keep them from hurting little fingers. We used bright colored number cutouts when we played our game, but you could also do it with handwritten numbers on paper or even numbered game cards. I just happened to have a stockpile of fun cutouts from an amazing paper sale at my local craft store. I should even be allowed to go to those. 😉 It’s unhealthy, but getting back to the activity, as long as you have a numbered something that the paperclips can clip on to, you’re good to go. For my little preschooler, I dumped the paperclips out in a pile, gave him his numbers, and let him start counting. His fine motor skills were tested when he tried to figure out how to attach two of the paperclips together. We slipped the large loop over the previous clips smaller loop, and before too long, he had the hang of it. Then he just had to keep track of how many were in each chain. It was fun to watch him pick his colors. There was definitely some pattern making going on in some of the chains. If there had been green paperclips in the box, we probably wouldn’t have seen any other color in the chains. He really loves that one. 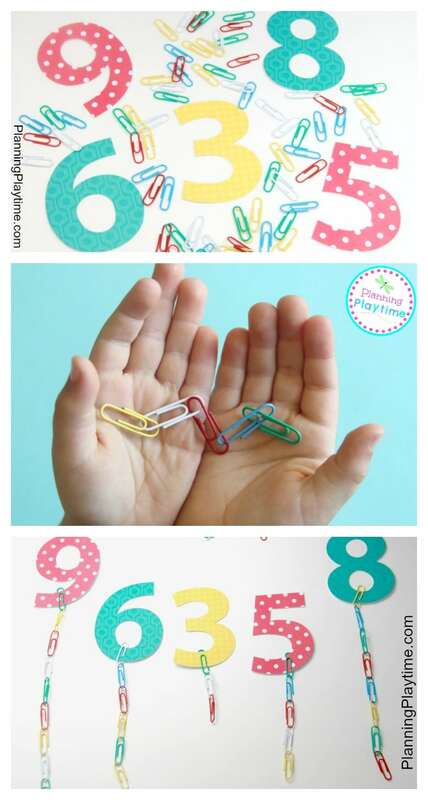 Thanks for checking out our Paperclip Chain Preschool Counting Activity, and if you have some paperclips lying around, pull them out and do a bit of counting. What a great idea! I especially love the fine motor skills that it is utilizing! I would have loved to do this with my kinders in the beginning of the year! It is a great combo of several skill. We really enjoyed it. Isn’t it fun?! I think it would be great for at home or even in a kindergarten math center. Thank you for your creative activities. They are awesome! Thank you Sharon! You are so welcome. We love to play while we learn, and it’s fun to get to share that. Thanks for stopping by.